Every day we are reminded to: “Eat healthy!” The message is reinforced through television and magazine ads as well as on the many self-improvement programs that address the importance of good diet for heart health and overall wellness. 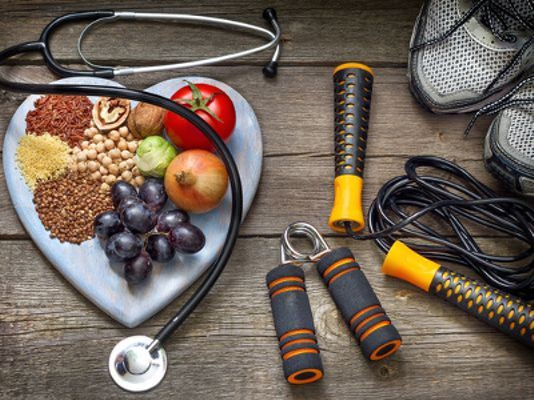 Most of us hear the message and, though our intentions may be good, quite often we are not fully aware of the steps we can take to reduce the risk of heart disease. • Limit saturated and trans fats: “Saturated fats are found in fatty meats, poultry skin, bacon, sausage, whole milk and whole milk products, cream, and butter. Trans fats are found in solid margarine, shortening, some fried foods and packaged desserts/snacks that list hydrogenated or partially hydrogenated oils on the label,” says Ms. Ferrari. The total amount of all fats consumed should be between 30-35 percent of the total calories per day; if you follow a diet of 2,000 calories a day, then the total amount of fat should be not exceed 75gm. • Control the carbs: While carbohydrate consumption is not necessarily the direct cause of an increased risk of heart disease, clearly the bigger problem is their relatively high calorie count, and its impact on weight gain. According to Dr. Trapasso, “the full impact of carbohydrates depends on individual needs, lifestyle, medical history, and activity level. Based on a 2,000 calorie diet, 45-65 percent of daily calories should actually come from carbohydrates.” In general, suggests Ms. Ferrari, all meals should be balanced and consist of lean protein, recommended fats, and complex carbohydrates. Complex carbohydrates consist of fruits (fresh and frozen are highest in nutrients and fiber), vegetables, whole grains and products made from them, beans/legumes. Heart-healthy eating: make it a habit! 2. Choose lean meats, skinless poultry and prepared without added saturated fat. 3. Look for fat-free and low-fat dairy products. 4. Opt for unhydrogenated vegetable oils such as canola, sunflower, olive or nut oils. 5. Enjoy nuts, seeds, and fresh fruits for snacks. 6. Consider meat alternatives that are also good sources of lean protein such as beans, lentils, tofu, and textured vegetable protein. 7. Reduce beverages and foods with added sugars. 8. Avoid processed/prepared foods that contain hydrogenated or partially hydrogenated vegetable oils under the listed ingredients. 9. Pass up cream and cheese sauces, and gravies.